Kitchen cabinets are as essential as the appliances. You need places to store all your dishes, food and spices. There are so many different options for different kitchen styles, but planning your cabinetry out beforehand for functionality and space efficiency is very important. One of the best things you can do before actually planning your cabinetry is to buy a couple of magazines or go online and pick out photos of kitchens that appeal to you in style, color and configuration. This will help inspire your design. Also check out kitchen storage and organization Websites, which give you a ton of ideas about storage, furniture, pantry organization ideas, kitchen cookware, bakeware and tools. It may even work out cheaper to build a 'less fancy' kitchen as far as the cabinets are concerned, but then add creative storage ideas inside those cabinets. Check out these Pantry and Kitchen Storage Solutions! Of course, one of the most important steps is measuring. Measure the space that you'll be installing cabinets in and write down the measurements. Write down the amount of space you'll want to use for cabinetry, remembering to leave space for counter top usage and ceiling clearance. Next, plan the functionality for your kitchen cabinets. Where do you want to store certain things, and how big will the cabinets, shelves or drawers need to be to accommodate everything. The worst is shelves for glasses, that don't fit tall glasses. Think how you would like to organize everything, and where it makes sense for things to be, such as a utensils drawer near the stove for convenience. Now go online or to a store and look at different colors, woods, finishes and hardware for your kitchen. You'll want something that meshes well with your appliances, floors and other decor. Walls are easy enough to paint but clashing counters and cabinets is a tough one to remedy. Use a custom cabinet maker or go to a cabinetry store to officially plan your kitchen storage cabinets. You'll want to speak with a professional to ensure your plans will work. If you can find a better deal online after you've confirmed the details then go for that. Remember to look for quality materials that will last and increase the value of your home. Planning your own kitchen cabinetry can be time consuming and somewhat frustrating at times, but being able to choose exactly what you want to have in your own kitchen is very rewarding. Alternatively, if you are working in your existing kitchen, you may enjoy some excellent space saver items for kitchen storage and organization. Simple things like undershelf rack wraps, or three tier can rack shelves, door racks for spices and small jars, or under sink shelving are all really useful. There's even pot lid holders on the cupboard doors. Check out these great organizational ideas for pantry and kitchen storage solutions here. Shop for Pantry and Kitchen Storage Solutions! How effective are your kitchen cupboards? If you're not able to do a kitchen re-model (!?? - who is? ), see if you can find one easy storage solution that solves one of your kitchen headaches. For me ... I just found a small wooden tray that was about to be thrown out - and I turned it into a useful holder for my coffee/tea/ hot chocolate supplies. Simple, yet it tidied a part of my pantry that was annoying me! It doesn't need to be complicated! Tell us how effective you were this week in solving one kitchen storage problem. Okay... simple is great... and even better if it is not too expensive! 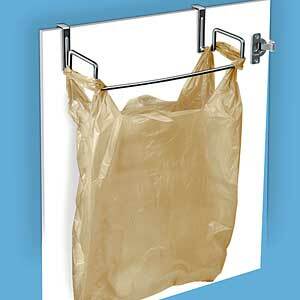 What do you think of this simple, yet effective cabinet door trash bag holders? Not only is it a good way to use those plastic bags you collect continuously from your shopping trips, but also useful to collect your recycleables and it hides nicely behind any cabinet door.